PEACE, PEACE - When There IS NO PEACE! Trouble behind Iron Curtain where is it leading? Did She MARRY TOO YOUNG? 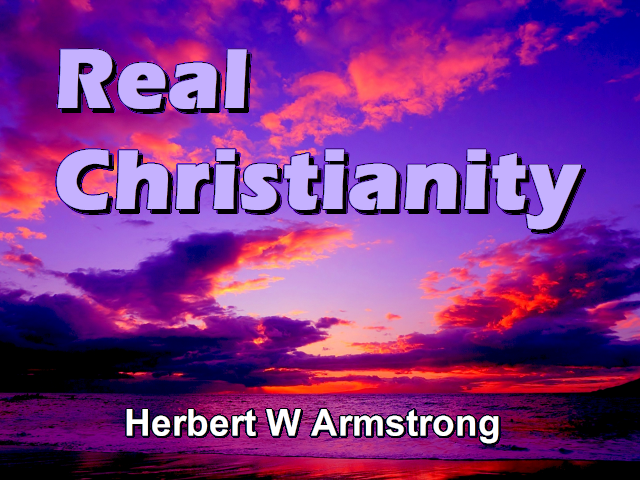 With all this upsurge of religious interest that we hear reported on every side, why is it, my friends, that almost nobody today knows what real Christianity is? Why are millions deceived? Why do millions think, as they say, they're saved and they don't even know what it is to be saved? They don't know what salvation is, they don't even know the process. There are so many ideas today and never have people been more mixed up on anything than this thing we call salvation. This religious issue; just what is it all about? What does it mean to you? What has it got to do with your practical life? And is there anything practical to it? It's about time we took it out and looked at it. There's a great deal of interest in religion today and in a good many quarters, that's all it is, just a passing interest. A lot of people know we're living in a world filled now with stockpiles of atomic bombs and hydrogen bombs and other still more destructive things on the way. And a lot of people are beginning to think they'd better get it all fixed up. Maybe they better go join a church and that gets it all fixed up but does it? Or is that just a superstition, and is it just sort of a fear? How many people have time to stop and think about what life is? And why they're here and where are they going? And what about all of these conditions we see in the world today? What brought them on? You know, this world went along for almost six thousand years; for a little over five thousand nine-hundred years, this world has gone along... without any such terrific, terrifying upset world conditions as we live in today. Former generations didn't know a world like we know it. But we've been living in it for a few years now and I suppose that a lot of us have sort of begun to take it for granted the world has always been like this. Why, my friends, the world was never like this until about the year 1914. You are living in a totally changed and new and different world than anything that we've ever had before. Oh, it's the same old world, the same ways, only we're now at the final grand smash climax at the close of this world. You hear a lot today about the end of the world. Is the world coming to an end? Well, what is the world in the first place? The world is not the earth! The world is merely the pattern, the system of society that man has developed on this earth. A lot of people don't know how that came about. You've been born here in this twentieth century, some of us in the nineteenth century; the latter part of it. We were born into this modern complex world that's getting more mechanical and more complex all the time. And we just take it for granted. And we suppose it's always been like this. A man of eighty-two years of age some years back came to me and he said "In all my eighty-two years, I have never heard anyone explain in a common sense manner that really made sense, the plain why's and wherefore's of this thing of religion. And what is this thing we call salvation? And why is it and how does it work? And how do I get it and how do I know whether it's anything that I want to get just what is it?" I've been dwelling on that a great deal and from different angles and giving you the different ideas of a lot of different people. And in the preceding broadcast, we devoted, I believe, about the entire time to the first verse of the third chapter of Hebrews. This marvelous book of Hebrews, the priesthood book. What is Jesus Christ doing now? About once a year, you remind yourself that Jesus didn't stay dead on the cross. His body was taken down from the cross and He was buried in the tomb of Joseph of Arimathea but, that's about as far as a lot of people ever go. About once a year, they remind themselves that He rose from the dead. But, do you really believe it? Or is that just something to talk about once a year; the time they call Easter. Now, if He rose from the dead, and if Jesus is alive, that's been over nineteen hundred years ago, what's He been doing these nineteen hundred years, where is He now? Is He like the Professor Emeritus? He did some fine things, He walked on the water, and He quieted the storm and He turned the water into wine, He healed the sick and He raised the dead, yes He did some wonderful things. It caused quite a little stir, thousands of people came to hear Him when He talked, in fact, they sought Him to, get Him to talk when He was trying to get away from them even. And, all that, but maybe He's like the Professor Emeritus, He's grown old and feeble. Does He do anything now? Has He got a job, does He occupy an office? Is He engaged and actually doing anything, now? You know in this preaching of what we call Christianity today we hear a lot of preaching about what Jesus did do during a three and a half year ministry over nineteen hundred years ago. My friends, why don't we hear a little about what Jesus has been doing not for three and a half years, not for merely thirty and a half years but for over nineteen hundred years! What's He been doing that time, what is He doing now? And what does it have to do with you? And your business, your job, your farm, your housework, whatever your job is. Whatever way you spend your time. What's He doing now? In the book of Hebrews, you read about what Jesus is doing now — His office now. And I want to tell you my friends, that because you don't know that, a lot of you are carrying a lot of cares and burdens and worries and headaches and heartaches that you don't need to carry if you knew what Jesus is doing now. Because, He ascended to heaven at the right hand of God as your High Priest if you want to accept Him in that office. If you want to come to God by and through Him and be reconciled to God. If you want to realize there is a living Jesus Christ, He's alive today. And He is on the job night and day for you and you aren't taking advantage of it. You know, it's a good deal like... I mentioned this once before. I might take a watch out of my pocket — now this is a very fine watch. Supposing I'd say I'm going to give you this watch. And I lay it down on the table right here before me, and I say "here it is", and you're across the room at the other end of the studio. "Here's the watch, it's yours now, I've laid it down, here it is, come and get it." Well, my friends, you're not going to have that watch you know unless you walk over here and get it. I'm not going to carry it to you. And you know, Jesus Christ is on His Father's throne, I almost said His throne and that would be wrong, He's not on His own throne. Jesus is not on His throne — He's on His Father's throne. He's going to come back to earth to sit on His own throne! But, He now sits on His Father's throne as your High Priest! And He is there to give you service, He is there to give you help. Now, you go into a very fine first class or deluxe class hotel. You might have even a fine special suite of rooms if the hotel has one. And all of the services included, you have maid service and you have special dining room service, you can have your meals brought up and served and there are people there to wait on you and serve you if you want them. Of course, they probably expect a tip for it, but nevertheless they're there. But, you aren't going to get the service if you don't go after it in a good many cases. That is room service or things like that at least. Yes, we have Him there but you're not going to get any service from Him my friends unless you go after it. It's there waiting for you! Now, Jesus Christ is on the job, night and day, but He's on the job for those that come to Him. Now there are people coming to Him, and He's keeping busy. But He's has plenty of time to look after you too. He has plenty of time to see that you get the right breaks. You know, very often two football teams, two basketball teams, are going to meet in a great contest. They're evenly matched. How's it going to come out? Oh, the speculation you read a lot more in the sport pages about it before the great game and the great battle than you do afterward. Speculation as to who is going to win — very often they say it all depends on the breaks. It all depends on the breaks. Call it luck, what ever you will. Do you know there's one on that throne up there as your High Priest that will give you the breaks? He has power to interfere even with nature. And the day of miracles are not past, they are past only for those who don't know God, who separated themselves from God and God has a way of performing miracles for His own people in such a way that the doubters and the skeptics never can see it. They don't get in on it. They don't get these blessings, they don't get these benefits. Now that's in Deuteronomy 30, verse 15 and then in verse 19. And you hear me quote this quite often. You're going to continue to hear me quote this a great deal. Don't think it's a repeat broadcast, because I use this in so many, I want you to get this. I want you to understand it. Now, my friends, you know, we assume and I think that even I have, that that means that mankind chose the wrong way. Well, that's true. But I wonder if you realize that that same thing is setting before you. And on the one hand, if you will choose the way of God and it is a way from Genesis to Revelation, all the way through the New Testament, all the way through the writings of the Apostle Paul; it is a way of life! And if you choose that way, it leads to blessings. It leads to life — life eternal. But on the other hand, if you choose the other way, it leads to curses while you live and finally ending up in death! Now, you're making your decision. I made a decision here, years ago. And I was willing to give up my life, you know if you seek to save your life, you're going to lose it. But, if you give your life for Christ's sake, He says you shall find it. Well, I'd come to the place — I won't take any credit — God had brought me to the place where I thought my life was nothing but a burnt out hunk of junk. There wasn't anything worth anything in it, and I said to God, "It isn't worth anything to me anymore, I'm all disillusioned." I was frustrated, I was a failure, after I'd thought I was a great success, but I began now to think I was a complete failure. I had totally lost all self-confidence. And so, I said to God, "If you want this life of mine, you can have it. It isn't worth anything." I didn't feel I was giving Him anything. I didn't feel I was really making any great sacrifice, I guess the sacrifice had already been made. I'd been brought to the place where there wasn't much there. But I said, "If you can use this life, you can have it." Well, you know He took me up on it. And He's been using it. Now, I didn't realize then I was choosing the way of blessings. I didn't do it in order to get blessings, I didn't do it for that reason at all. It just seemed there was nothing else I could do at the time. Now, I came to a new kind of confidence, I never did regain that self-confidence. I haven't got much of that today. But I came to have faith in God! And that's the kind of confidence, if you will give your life to Him, if you place it in His hands, if you know you are only an instrument in His hands; you're the clay, He's the master potter. You come to God and you be willing to live God's way, you come to this High Priest and let Him guide you, let Him live your life for you, let Him live His life in you by His spirit which is in you, or will be, could be, should be and my friends you get blessings! But you say, "well, I'm sufficient unto myself. I don't believe in God's ways. I don't like that law of God. Besides, some preacher told me that law is all nailed to the cross. And God is a hard, stern master. I don't think He loves me. He just wants me to be miserable and unhappy." So you say, "I think I know a better way" you go your own way, and you're just going the way of the curses. And you're going to reap those curses. Now, that's the way with the skeptics, the scoffers, the doubters. Oh, they may have fine minds, they may be even scientific gentlemen, but if they are hiding their minds from God, they're under a curse, that's all. And they have plenty of fears and worries. And they make plenty of wrong decisions. And they get plenty of bad breaks. Now, if you are going to come to Him and get all of these benefits and these breaks, He's probably going to punish and pin your ears back a little bit once in a while because you need it. Just like any loving parent. And you're the kind of a child that's going to get out of hand once in a while and you won't be listening often enough and well maybe that's the thorns on the rose bush but these thorns are good for you. They aren't going to give you any blood poisoning. They're good for you. You've loved your fathers of the flesh that have corrected you, if they did and I hope they did, for your own sake. But, I started in I've been punished that's true, but I've always had the breaks. Let me tell you, everything has broken just right. And God has made certain promises that in the end things will turn out a certain way and they've turned out that way. And I've found what it is to be happy and I can look back over a life now without regrets. Oh, I've had plenty of regrets as I've looked back over my past life. If it weren't that everything that would come in the regret column has gone, as our fundamental friends say, right under the blood of Christ in other words, Christ Himself took every one of those things on Himself and He paid the penalty in full and I don't have to pay it. But I had to repent of it and I had to be so sorry I'd turn around and go the other way and not make that mistake again and I had to confess it. And, well He paid it and I don't have to do it, and I don't have to worry about that end of it. But, because I've relied on Him, because I've trusted Him, because I've known there was a High Priest there, because I've gone boldly to this throne of grace so many hundreds of times I've had the breaks. I've got a lot of enemies, I've got a lot of people that scoff and sneer, they would accuse of any and everything. But, listen, God Almighty hasn't been my enemy, He's my friend, He's given me the breaks! He's given me everything that a man could possibly want and desire in this life to make him happy; I've got. I've tried to serve Him well in spite of what enemies might say. God knows a man's heart, you know. And God looks on the heart. I don't know what enemies see in me, but I do know what God sees. I know that He sees some wrong and then He punishes me. And He straightens me out and makes me right. Doesn't have to do it as often now as He used to. On the other hand, He has kept every promise. I started out wanting material blessings. I had to give all that up. I had to give it all up because I had to find the spiritual blessing are more important, and so then, my wife and I got the spiritual blessings. Oh, we've spent some of the happiest hours till it just seemed like there was...I don't know how to explain it, it was like brilliant sun light, like jewels of silver and of sparkling diamonds and things around; just sort of sensing there were angels present. That's just something you experience and it isn't any fanaticism. This thing seemed pretty real, I've always been rather practical. And just studying the Bible and getting understanding that was so precious with humble people, without much education and living in a one room shack with the beds over in one corner or two and the dining table and a cook stove. And no rugs on the floor, but where the floor was kept clean and everything was immaculate and neat and in place. Even though they had practically nothing and perhaps some of the chairs with old bailing wire tying them up to keep them from falling apart or something. You know, I've been in homes like that and spent hours with people like that and we've been happy. And we've known what it is to go hungry ourselves and still find happiness. Well, God has never made us rich or wealthy; He doesn't promise any such thing. But we don't have to go hungry anymore. We have everything that anyone could want or need. What is there more than having enough clothes to wear and enough food to eat, and shelter and a nice roof over your head. What I know and when I tell you, my friends, that these things pay off, I know what I'm talking about. I've been putting it to the test. I don't have to look back with regrets. And I can look forward just like the Apostle Paul, forgetting the things that are behind that are unpleasant and I can look back on, well let me tell you — I know there are thousands of you people listening right now whose lives have been changed because God has used this voice and poured out His message through it and I've merely been an instrument but I've had a little part in it, haven't I? I get a lot satisfaction out of that and changing your lives. And bringing many sons to glory, as Jesus the captain of our salvation has been leading. He uses some of us as instruments. Well, there I go getting off the track again, listen: "...we have a [this] great High Priest, that is passed into the heavens, Jesus the Son of God, therefore he says, let us hold fast our profession." (Hebrews 4:14)... and our confession. And it is a profession, it's a vocation, it's a life occupation if you know what it is, it isn't just something to join a church, it isn't just something to, well, to shed a few tears on an altar, or to say before people "I've made my decision for Christ" or "I've received Christ" or something like that. Oh, it's a great deal more than that, it's your life, it is your life; it's a changed life! It's a life filled with God Himself and all of His fullness and His power. Filled with wisdom, filled with knowledge, filled with a sense of the right values instead of the wrong that you always cherished before. And it's a life where you have this High Priest up there guiding you. Where you have this counsel. Now, just in a material sense, we keep an attorney who has all of the legal knowledge for advice, and counsel. Now we keep a man like that here in our staff. Well, that's just for some material things, one thing or another that might come up; many decisions of that sort. But listen, I have one counselor that I go to above all others! Now, in a multitude of counsel there's safety, and I have various groups here on our campus and here at the headquarters of this great work that goes around the world now and I have different groups that I call in to counsel with on different problems. College problems, I call certain groups. Business problems, I call in certain other men. And in a multitude of counsel there's safety. But there's one counselor above all and that's this counselor that sits up there on the throne of grace. He's my High Priest. And I go to Him continually. And He tells me through James, if I lack wisdom, and I ask of Him and He will give it! (James 1:5) And I expect to get it when I ask and I do! And He's prevented me from making many a wrong decision that might have cost this work and the co-workers who make sacrifices and are loyal with their tithe money that isn't theirs but belongs to God and who are liberal with their free will offerings that make all this possible for you. And makes it possible for me; broadcast after broadcast after broadcast to give you this message, offer you things absolutely free and to emphasize it's free and there's no subscription price, and there's no charge and never say a word about money. You don't find me asking for money and this is no request for money either I'm just explaining something. Well, I'll tell you, I would have lost a lot of their money, many a time if God hadn't given me enough wisdom to prevent making wrong decisions. And it's God's money after all and we have to be very careful about it. That means He never made a mistake. Because sin is a great mistake, it is the biggest mistake you can make! Sin is the transgression of God's law; God set laws in motion! A lot of people today think they have religion but they don't believe in the laws of God. They don't believe in obedience to God, they believe in the ways of man, of this world. This world is coming to an end and soon. But this world is the pattern of society that's been built on the earth that is damning the souls of men. It is making people unhappy. God calls us out of this world and to be separate. He tells us about the happy, peaceful World Tomorrow and it's coming and it's coming soon! "...consider [it says here], the Apostle and High Priest of our profession, Jesus Christ." (Hebrews 3:1) Well, the knowledge about Jesus Christ is a very wonderful thing. But you know what I teach our students here at Ambassador College? They come here to gain knowledge. But they also come here to gain experience. And to learn how to apply knowledge because I tell them that knowledge is of no value except as you put it to work. As you apply it. It's the result that counts. Not just getting knowledge — it may be pleasant to have knowledge come into your mind. Some people enjoy it and some don't. But, nevertheless, it is very practical if you put it to use. If it is right knowledge and if it works and if it produces the result. That's the thing that counts! Well, it's up to you. It pays off my friends. It's a very practical thing. You know, real Christianity is a living thing and it's going to change your life and it's a different life all together. A life in Christ Jesus.